If you read this post after reading my Black Forest Cake post you might wonder why I go for cakes with cherries. The reason is I love cherry flavour be it wine or cake and especially the combination of chocolate, cherry wine and fresh cherries. So I decided to make this for our first wedding anniversary. It turned out perfect for the occasion. For frosting the cake I used Mrs Milman's Chocolate Frosting. The procedure for making this cake is similar to the Black Forest Cake recipe. You need to make a sponge cake first then prepare the syrup for moistening the cake and finally the frosting. The steps are outlined below. Prepare the frosting as mentioned in the link. Allow it to chill for some time in the refrigerator so that it attains the desired thickness for frosting. 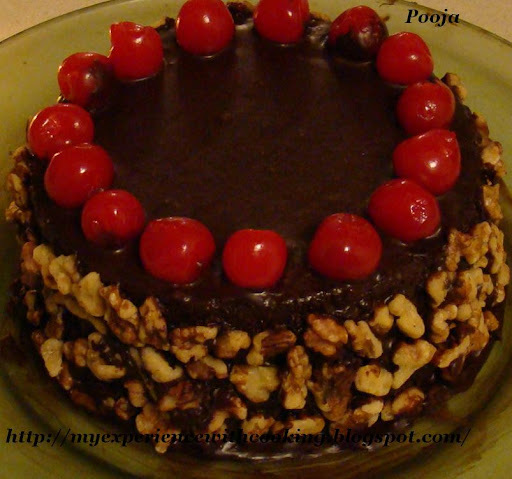 Decorate the cake on the sides with chopped walnuts and the top with cherries. Before serving warm each slice in the microwave for about 15 seconds.